Swedish blogger Pawal at Datasvammel made the headlines of several of the major news media in Sweden Wednesday, when he revealed that Swedish State television uses a UK service to filter their incoming email. There’s a current debate about data surveillance in Sweden, since the government wants to increase the possibilities for Försvarets radioanstalt, FRA (the radio surveillance dept. of the Swedish military defence), to ”listen in” on email and phone conversations to and from other countries. The proposition has received a lot of critisism. The government says the objective is to fight terrorism, but critics claim that the proposition is a threat to our personal integrity. Some call it a ”1984 proposition”. I like visual aspects of surfing blogs, and I like to see faces. 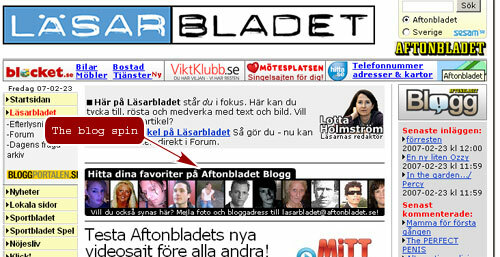 That’s why I introduced the ”blog spin” on Läsarbladet, a small flash banner displaying random faces from Aftonbladet’s blog community and linking to their blogs. I also use MyBlogLog where I get to see the faces of visitors to my blogs, and show mine whenever I visit other MyBlogLog users’ sites. In this spririt, Tino Buntic started the 2kBloggers project. I’d like to showcase all of them, but I’ve settled on just 2000 bloggers. Bloggers come from all walks of life! Some are SEO experts. Some are writers. Some are sports enthusiasts. Some are affiliate marketers. Some are business professionals. Some are political. ALL HAVE OPINIONS!!! 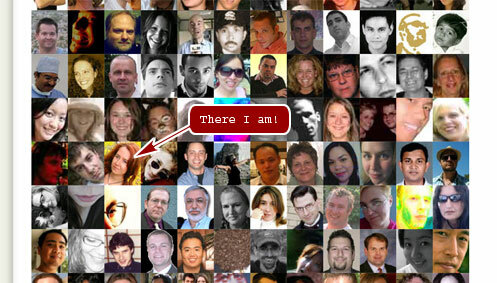 On the 2000 bloggers site, he’s displaying and linking to 2000 bloggers who have signed up to be included. I’m in there with a link to this blog. Here’s the montage of all the bloggers’ photos. I think it’s a nice way to get a bit more personal. There’s also a Buddymapping map for the 2kBloggers. Oddly enough we’re only tree people on it. Expect new updates in this blog on Monday or Tuesday. Have a great weekend! Baiduer, a blog focused on immensely popular Chinese search engine Baidu, is now available in English. Since December, Baidu also has a blog search engine, so Baiduer could potentially become a good source for news about the Chinese blogosphere. SvD writes, in an interesting article by Karolina Andersson, about new ways for writing fiction. A couple of examples: Jennie Dieleman inviting the general public to finish her novel. And the upcoming Swedish version of a British tv show where known authors start a short story, then invite people to submit endings, a jury selects three (why not let the visitors of svt.se vote? ), and finally the original author chooses a winner among the top three. The short stories will be published in a paperback edition. Contributing authors are Jonas Hassen Khemiri, Åsa Larsson, Johanna Hildebrand, Håkan Nesser and Sara Kadefors.